The following diagram outlines the high-level abstracted tasks usually involved in each phase in the API lifecycle. In the design phase, architects and lead developers can use Anypoint Design Center to design APIs. APIs are authored in RAML files, which include all different resources such as API fragments, specifications, and examples. 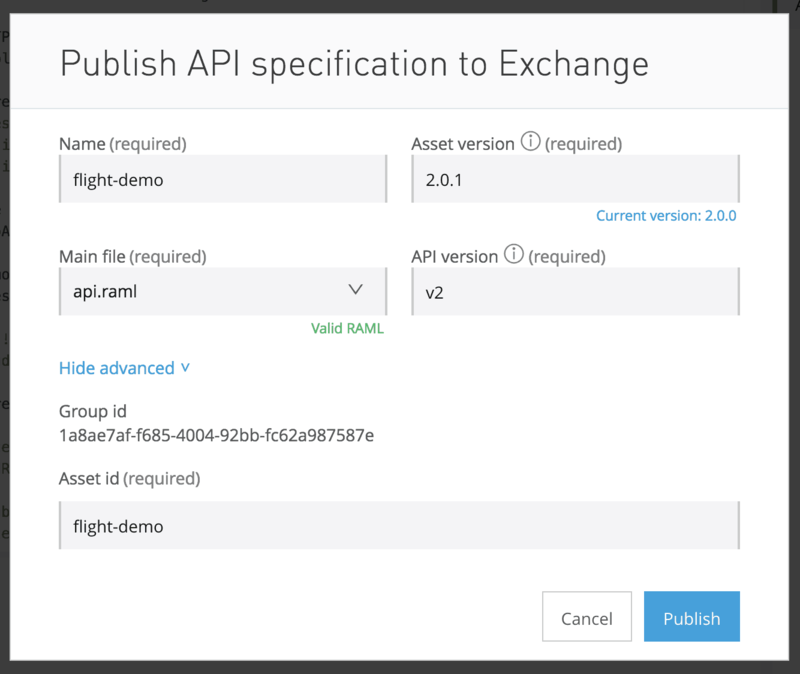 Once the API spec files are ready, API designer can publish the API RAML files to Anypoint Exchange. To publish the API RAML files to Exchange, you can use the “Publish” Option in Design Center. Every resource published to Exchange is considered an asset, which means it has an asset ID, asset versioning, and other meta info. The “API version” field is derived from the “version” field in the main RAML file (value “v2” in the above example.) The “Asset ID” and “Asset version” are unique attributes associated with this API asset. Once the design and contract are finalized, a developer would need an API asset from Exchange to start implementing the API in Anypoint Studio. Once the development is complete, we are ready to move to managing and deploying the API. The type of API endpoint in API Manager “Basic endpoint” versus “Endpoint with Proxy” will decide the deployment pipeline. In both cases, an API instance needs to be created with reference to the Exchange asset, but for the basic endpoint, you need auto-discovery properties generated by API Manager to pair an API instance with a Runtime Manager application. Please note this flow changed in November 2017, in the previous version of Anypoint auto-discovery properties were user-defined, but now those properties are provided by the platform. In case of the “endpoint with proxy,” you can either deploy using API Manager or download the proxy application to be deployed with Runtime Manager Management API. First, we will define the system properties for username, password, organization, and environment ID of the Anypoint account, and we will also define two helper methods that will be used in the pipeline. This pipeline provides a basic CI/CD framework using Groovy scripting. The first step is to get the authentication token using Anypoint credentials, the snippet shows how to call the accounts/login API to obtain a token. First, we need to get the project and branch ID from Design Center, these will be used to publish the asset to Exchange. This step publishes a Design Center project to Exchange. Please note this is only meant for RAML/OAS asset types. If you wish to manage a SOAP/HTTP asset type please publish the asset into Exchange directly using this API. You can also use Anypoint CLI for automating design center projects, for more information please see this documentation. // This request can be parameterized depending on the requirements. For demo purpose they have been hard-coded. 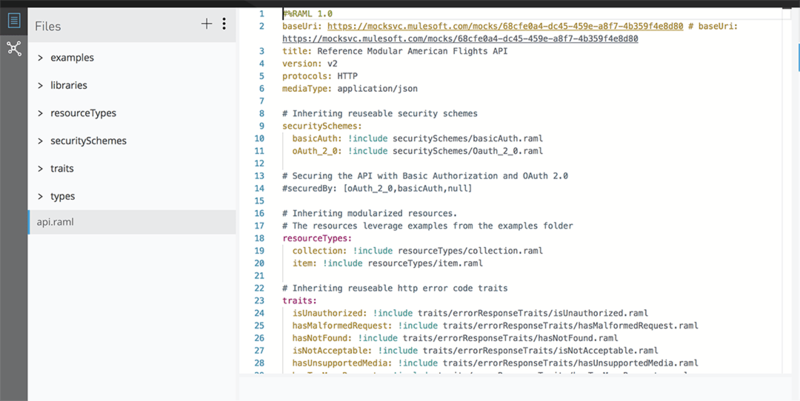 def urlString = "https://anypoint.mulesoft.com/designcenter/api-designer/projects/" + result.projectId + "/branches/master/publish/exchange"
Refer to this code in case you need to fetch the details of an asset published in Exchange, such as the Asset ID, API version, Asset version, and group ID. This step is the equivalent UI step of “Get from Exchange,” we will manage an Exchange asset in API Manager in order to apply policies and other runtime governance. def urlString = "https://anypoint.mulesoft.com/apimanager/api/v1/organizations/"+props.orgId+"/environments/"+props.envId + "/apis"
The response apiInstance contains an id unique identifier for an API in API Manager. This ID is used for other API operations like applying a policy, API promotion, API deprecation, deleting an API, finding out autodiscovery properties. To manage a Mule 4 API, you must set this property to true muleVersion4OrAbove. This step is optional and only needed if an API type is a basic endpoint type. This endpoint is invoked to get auto-discovery (API name and version for Mule 3), which will be used when deploying to Runtime Manager. The examples below get auto-discovery for a Mule 3.8.5 API. def urlString = "https://anypoint.mulesoft.com/apimanager/api/v1/organizations/"+props.orgID+"/environments/"+props.envId+"/apis/"+apiInstance.id+ "/autodiscoveryProperties?gatewayVersion=3.8.5"
Note: For Mule 3 APIs, you need api.name and api.version, but for Mule 4 APIs only api.id is needed. For more details, please see read this documentation. This step fetches all the available instances in an API environment and filters the result based on an Asset version and Asset ID. Once the parameters required for auto-discovery are discovered and an API is secured via policies, the next step is to deploy the application to Anypoint Runtime Manager and use auto-discovery properties to manage that API. In this example, we will deploy an application to CloudHub using Anypoint CLI and use property placeholders for configuring auto discovery properties. The combination of these two values: API Name and API Version (see the diagram above), identify a unique instance in API Manager. This information is important to link this API instance to the running application that will implement the API. It also allows its management (apply policy, statistics, alerts, etc.). The client_id and client_secret identify the environment where the Mule application is running. Therefore, these parameters should be passed to the application to be used by the component “API Auto-discovery” as part of the configuration management process prior to deploying any environment. -o, --output <format> Output format. Supported values are: table, text, json. Defaults to `text` for non-interactive and `table` for interactive sessions. -f, --fields [name][,name2...] Name of fields to output. Provide multiple comma-separated values to limit output to multiple fields. E.g. : "--fields 'Email,First name'". echo "Application was Staged and is now being deployed"
echo "There was a problem deploying your application"
This demonstrates how to deploy an API proxy for a proxy endpoint API to CloudHub 3.8.5 runtime using API Manager proxy API. def urlString = "https://anypoint.mulesoft.com/proxies/xapi/v1/organizations/" +props.orgID+"/environments/"+props.envid"/apis/"+apiInstance.id+"/deployments"
Tip: There is an alternative for proxy deployments, which is to download the proxy application using the API Manager management API and then deploy the application using either Anypoint CLI or Runtime Manager API. Once the developer has completed testing in the development environment, the next process is promoting the API from the development environment to the test environment in API Manager. This promotion can include policies, tiers, alerts. If the API is of basic endpoint type, then promote the application in Runtime Manager to the test environment and use the new auto-discovery properties that will be retrieved using the “Getting Auto-discovery details for an API” step. If the API is of proxy endpoint type, then deploy a new proxy application in the Runtime Manager TEST environment. This concludes the basic of building a CI/CD pipeline using Anypoint platform. This is done through both interactive shell and standard CLI modes for both Anypoint Platform and Anypoint Platform Private Cloud Edition. To know more about CLI and to install it on the server that runs the CI/CD tool, look at the documentation. Which use case are you planning to use for CI/CD? Let us know in the comments! Thanks, a timely article for me – as I was looking for automating deployment. However the approach I was interested in – via Management APIs, is still not clear. You referred to Management API in you Tip but that URL doesn’t seem to support Mule 4. Is this conclusion correct ? Can we use management APIs for automating deployments ? That mock service requires parameters like organisation Id, environment id and environment app id. I couldn’t locate the last 2. It’s possible to use the same API for Mule 4. query params can be used to specify the gatewayVersion. EnvironmentID is the environment where that API instance is located. I was able to fetch information from that API. 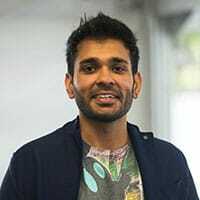 Could you please let me know which Runtime Manager API to use for starting/stopping an API instance(undeployed state) in Runtime Manager ?